Carpenteria californica is a hardy evergreen shrub with dark green leaves that is grown mainly for its fragrant flowers. 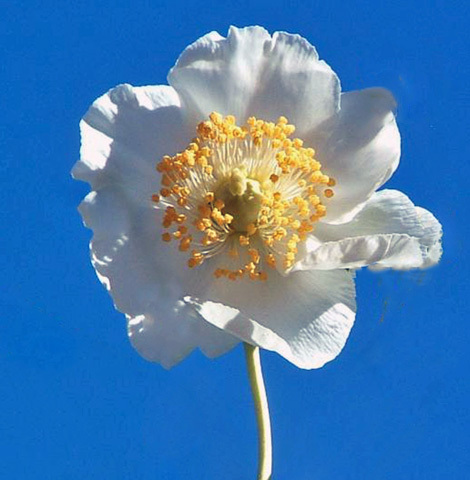 The single white anemone-shaped, scented flowers are 50-75mm (2"-3") across and appear on top of yellow stems in June and July. The shrub generally spreads to around 1.5m across and around 1m high, although in the wild they can grow up to 4m high, because of this it is a useful plant to grow against an unsightly wall. It is best sited in a sunny spot and will tolerate drought conditions but appreciates the occasional watering during such conditions. They can also be propagated from seed. They may take around 2-3 weeks to germinate. When large enough to handle (circa Week 15) prick them out into 70mm (3") pots. Alternatively sow them around Week 24 and place them in a cold frame to germinate and grow on. In both cases grow them on in a coldframe until they are of a suitable size to plant out into their final quarters. They may require potting up into ever increasing sized pots until planting out time.